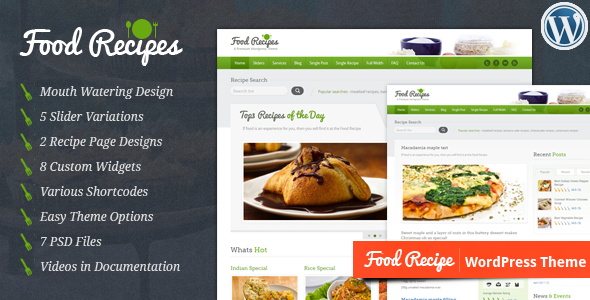 The best WordPress recipe theme is Food Recipe, this theme has a good feel and look that makes it a must get for anyone who wants to have a professional recipe site. Some details and feature I found fascinating is the scheme.org Micro-data implementation for Recipe pages, and the need to use less plugin for functions like reviews, contact page among many others. This is the ideal recipe theme and the very best for 2014. To have this theme developed by a web programmer or developer could cost over $2000, which is available at almost a give away price in this market. Using the best WordPress recipe theme gives you several advantage which includes fast indexing, high SERP ranking, visitor friendly theme, interactive and detailed layout. Various Short codes for columns, styled headings, tabs, accordion, toggles, buttons, list types, message boxes and other features. 8 Custom Widgets to facilitate user. Video based documentation so that you can get the theme setup quickly. So far the best wordpress recipe theme, it is totally in compliant with the industry standard and SEO friendly. Food Recipe is the way to go.